Forget store-bought salsa! 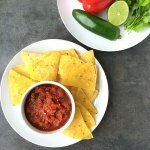 This homemade salsa recipe is so fast and easy to make that you can whip it up any time! I am a HUGE fan of chips and salsa. It’s one of my favorite parts of going out to eat Tex-Mex or Mexican food. In fact, if the chips and salsa aren’t good, I’m probably not going back. It doesn’t matter how good the rest of the food is if the chips and hot sauce are bad. Luckily, Texas is full of good chips and salsa! 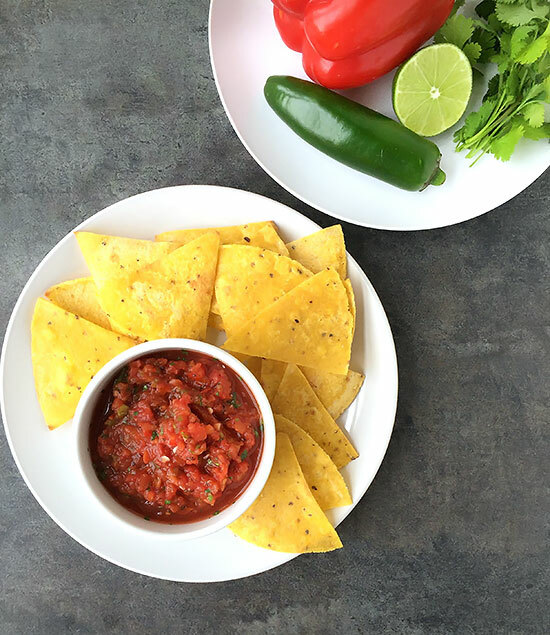 While I love going out to eat, I like having the ability to whip up a quick batch of salsa to eat at home. It’s so easy to make that there really isn’t any reason to buy a jar. Plus, you get to control the quality of ingredients. I used a can of Muir Glen fire roasted diced tomatoes for my recipe. This Homemade Salsa recipe makes about a pint of salsa. I cut some tortillas up into wedges and fried them to eat with this batch. By the way, kitchen shears are a great tool to use for this task and for making tortilla strips. I was using a knife before, which was a pain. The kitchen shears are a whole lot faster and easier. Place all of the ingredients into a food processor or blender and pulse until you reach your desired consistency. Use a tortilla chip to do a taste test and adjust if necessary. Refrigerate 1-2 hours before serving to let the flavors marry. I started with 1/8 tsp of sea salt, then increased to 1/4 tsp. 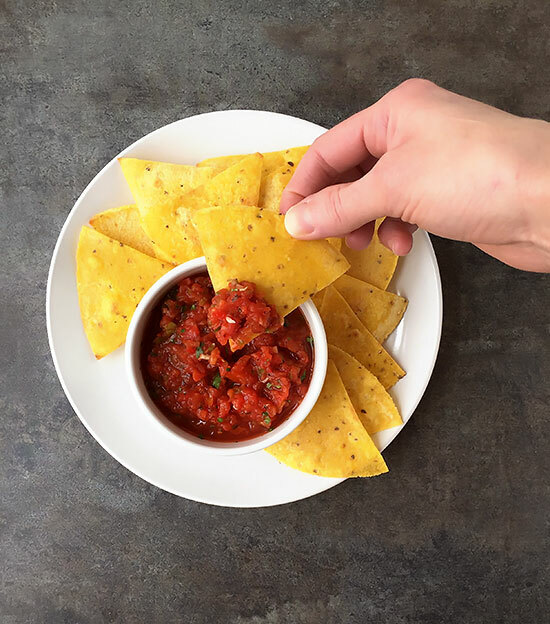 Tortilla chips can vary in saltiness, so that's why it's good to do the chip taste test.